I have seriously conflicted feelings about Conjured. Although I loved the magical and mysterious feeling to it, I had a difficult time caring about the main character and thought the plot dragged on too long. "The guy who drops you off...looks like a bodyguard? Probably knows six kinds of martial arts and carries a knife in his socks?" Zach's eyes widened. "I can never tell if you're serious or if you have the most awesome deadpan delivery of any person alive." I just thought he was a fun character. Besides Zach, I also thought it was cool how Eve keeps waking up with no memory of what happened in the last week or two. The idea of missing memories is rather fascinating, and it drew me quickly into Eve's story. I think the last quarter of the story is the absolute best. The pacing in the first third or so is a little funky, but Durst's writing simply shines in the last quarter. It was so creepy and magical, and a bit reminiscent of Alice in Wonderland - it has that eerie dreamlike feel to it. Lovely! The changing POVs were rather jarring at first. Every time Eve has a vision, it switches to first person, and it took me a little while to get used to it. (Warning: minor spoilers in this paragraph.) There's also the fact that Eve and Zach have to kiss each other to work magic. I found it to be cheesy and a little too much like a Disney movie. I much prefer the dark, creepy magic that Durst is so talented at writing. I didn't care much for Eve as a heroine. She's a little too wimpy and unsure of herself. I just wanted her to toughen up and make decisions for herself. I should also mention that the plot takes a while to really kick off. For those who are looking for a thriller-type of story with action and twists - there's not really much of that in Conjured. It's a strange genre: it has many contemporary themes, especially in the first half, but there's also a definite fairytale feel to it. It's not necessarily bad, but it may not be what some are expecting. 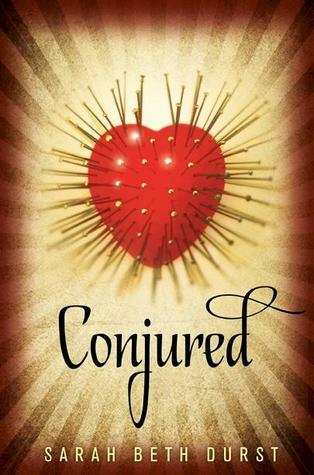 Despite not caring much for the heroine, and the fact that there's not as much fantasy as I would've liked, I'd still recommend Conjured. It has an achingly gorgeous ending and amazing fantasy elements that come into play in the last quarter, and I liked the sweet romance. Just be prepared that this book might be different than what you'd expected. Favorite quotes: "Once upon a time, a young witch fell in love with a boy who feared death...and it was beautiful. For a time." "If my insides were a book, she thought, I'd be a jumble of volumes, stacked in random order and filled with blank pages." *Please note that these quotes are from an advanced copy and may be different in the finished book. I must say that the book description sounds rather intriguing, and if you're saying that the last quarter is worth it, then I might consider giving this book a try.